We have always offered key cutting at our security shop but occasionally we would get a more specialist key that would have to be sent away. Now, thanks to heavy investment in some sophisticated key cutting equipment, we can cut pretty much any domestic key while you wait. This includes cylinder keys, mortice keys and dimple keys. We can also do safe keys, cabinet/locker keys and padlock keys. Not only does this new equipment allow us to cut a wider range of keys, it also cuts to an even higher degree of accuracy. 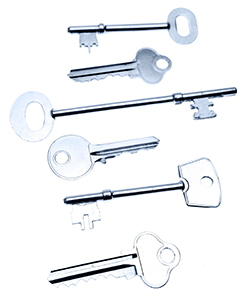 We can cut from keys, from codes and from security cards and because of the computerised system within the machine, many keys will be cut to original spec with none of the issues that arise from taking copies of copies of copies. We don’t think that any other key cutting provider in the Wakefield area can offer this level of service. Don’t forget, we’re also Master Locksmiths so we can key locks alike, repair locks and offer a range of safe engineering services. Do you have keys you can’t get cut anywhere or that other shops have to send away? Bring them to us and see what we can do. We’re confident we can cut the vast majority of household keys while you wait so before you go anywhere else, try us first. We’re conveniently located just off junction 40 of the M1 and a couple of miles from Wakefield city centre. See where we are here. previous Can your Facebook data be used to target your home for burglary?